KidsTown Live! 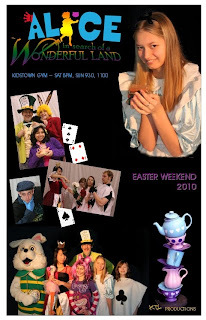 for Easter 2010 featured three performances of our parody parable of the popular Disney movie Alice in Wonderland, entitled "Alice in Search of a Wonderful Land." All children grades 1st-6th and anyone wishing to still be in 1st-6th grade were invited to come. Over two hundred came out over the weekend to see the cast and crew of KidsTown Live! tell the tale of Alice, played by our very own and much beloved, Morgan Eldred. Joining her was a whole host of very talented actors and support people. A special thanks goes to Amy Leslie for supporting yet another big show production of KTL as backstage manager. Amy's talents in orchestrating the backstage props, scenes, and most importantly the actors has been showcased in every major KTL production which includes Wizard of Oz, Narnia, Bedknobs and Biblestories, Polar Express, Iron Chef, and now Alice. Such productions would be impossible without Amy. Also joining Amy as supporting crew were Kamol Khamphong who has faithfully served as sound and video guy for KTL for two years and first timers Sarah Hill who assisted Amy and Chris Hill who ran the lighting. Though new to KTL, Sarah and Chris are not new to big performances as they have assisted in our Easter Passion Play and Vacation Bible School productions for several years. Randy Ritter shot almost all of our photography for Alice and Allen Boichot filmed the show, edited the dvd, and conquered the gym windows light for the first time ever in KTL! A special thank you also goest to those who assisted with setup: the Orlando family, Darren Baroni, Brian Morris, and Rob Stewart. Meal assistance was graciously provided by Beth and Randy Ritter and Akemi Orlando. The "Eat Me" cookies were a special gift treat made by our very talented baker, Janet Otto and our white Alice sheet cake given to the crew as well as the little pink prop cake used in the production where made by our good friend and amazing supporter Norman Davis of the Sweet Life Bakery right here in Annandale, VA. Norman was our host for our Summerfest Cake Challenge in '09 and is a well-known tv cake show competitor for the Food Network and TLC. To know more about Norman and his bakery, click here. We followed up our Easter show with a return to Wonderland the following week as we reviewed with the kids some of the important spiritual principles and truths that we had woven into the storyline the previous week in our show. Among some of the many topics reviewed were the Dormouse who shared about eternity and the two options we have for what kind we will one day have, the Caterpillar who shared about who we are in Christ, the Talking Door who shared about the "key" to a new life, the 3 of Clubs who shared about condemnation, the Queen who spoke about the true value of life, the Cheshire Cat who shared about how Christ will always be there watching over us, and of course, Alice who shared about how this life is not the end! Additional photos available online at Snapfish. To learn how to access Snapfish, click here. A 2-disk DVD is available from this production. It features the actual live show and also a photo library dvd. It is available for $15. Click here to find out how to get your copy today! If you would like to see what we did for Easter in 2009, which includes our first ever God Rods performance and our Bedknobs and Biblestories KidsTown Easter Show, click here.